Merriam-Webster defines esoteric as designed for or understood by the specially initiated alone, limited to a small circle, or of special, rare, or unusual interest. To me, this translates into exotic, which is exactly what I was thinking of when this piece was designed. This is a OOAK (One of a Kind) piece of luxurious beauty and colorful elegance combined in a bold statement. This green and gold beaded wrist cuff is carefully created from a combination of beautiful green beads, golden Tibetan beads and unique detailed accents. It's a piece that's sure to make a bold, elegant statement whether worn with a casual outfit or something more elegant and refined. 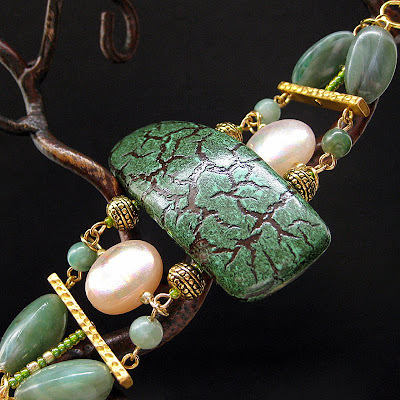 This unique, handcrafted bracelet is then finished off with gold plated chain and measures 8-inches (20.3 cm) in length including the matching toggle clasp. I've seen a lot of odd things hanging from rear view mirrors. It's actually somewhat of an interest of mine and I catch myself checking out what dangles from other people's rear view mirrors in their cars on a regular basis. It's almost a habit. I think they add personality to a person's car, making it a bit more "theirs" and putting a stamp of their style on what could very well be considered a rather large glass and metal box on wheels. 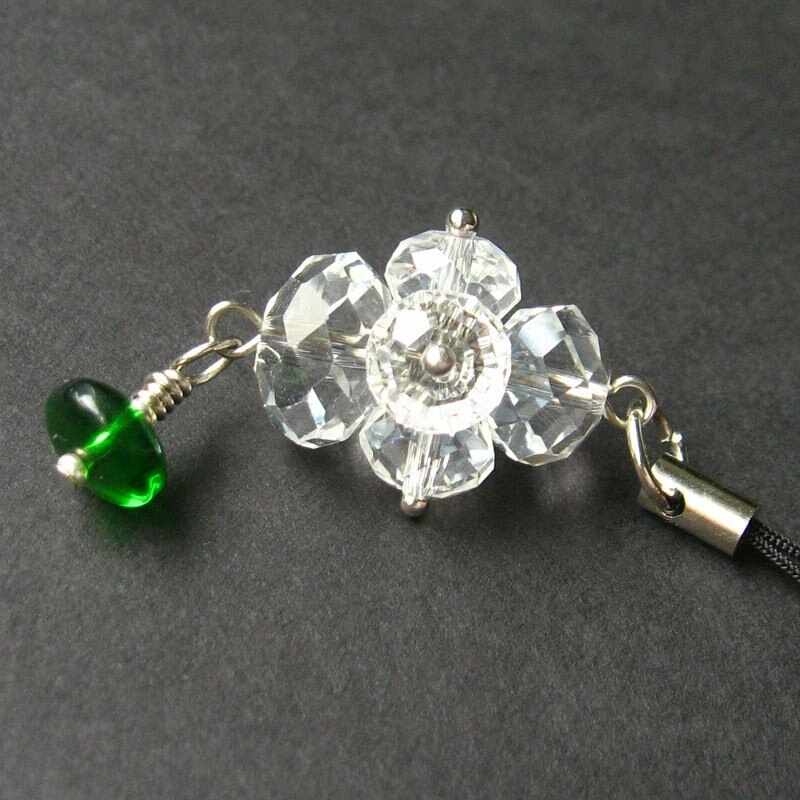 This handmade car mirror charm is very similar to the little dangle I have hanging from my own mirror. A cluster of crystals with a green glass bead dangling on the end define this handmade charm that can be used for more than just a car mirror charm but could also be added to a phone, zipper tab, key chain, purse or anything else that needs a little cheering up. This charm is a unique OOAK (One of a Kind) piece and measures at 1.57-inch (4 cm) in length. I don't make all that much bridal jewelry, mostly because I'm infatuated with color and most brides I've known want to wear white. 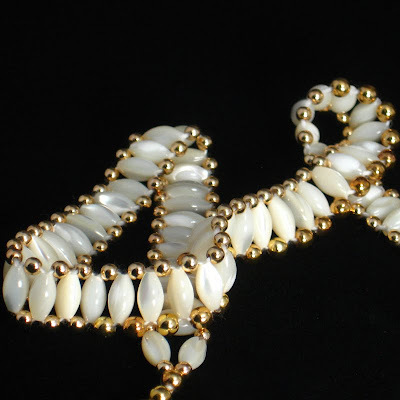 But, when I saw these beautiful vintage mother-of-pearl beads, I knew I had the makings of a bridal piece that could be both luxurious and elegant as well as fit into both the "something old" and "something new" of tradition's lore. This is the first piece of bridal jewelry I've ever made, and I'm very happy with the results! It turned out better than I'd even imagined that it might and I've named the piece "Heaven's Ladder" in dedication of the anticipation of a happy life that comes with the wedding vows exchanged on that special day. The Heavens Ladder necklace is handmade with a combination of vintage mother-of-pearl rice beads combined with golden accents. It's designed with beading string instead of wire to ensure an extra level of flexibility between the beads for a comfortable fit that encircles the neck and lies flat against the skin. This necklace is a unique OOAK (One of a Kind) piece and measures 18-inches (45.5 cm) in length. The other day I was in town doing a little window shopping while I waited for my ride to pick me up and I spied this beautiful angel in the window of one of the little boutiques I passed. She was so beautiful, that I had to stop in for a visit and, in the course of the visit, we became good friends. We became such good friends that I decided that I had to take her home with me! Now, she has a new home.... and a new job as well. This angel is such an inspiration that I've decided to use her to "model" some of the handcrafted rosaries that I've made and I have now begun the process of re-photographing many of my rosaries to include her in their pictures. This particular rosary pictured here is one of my favorites. I know I say that about every one of the rosaries I've shared so far, but I can't help but having a number of favorites and I love sharing them! 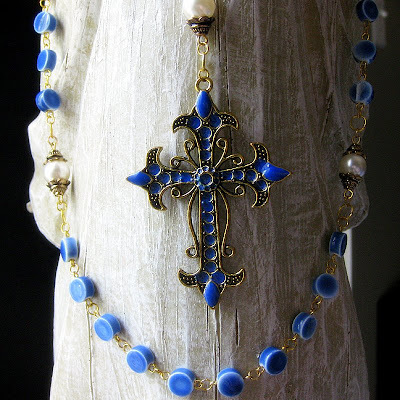 This handmade rosary is made from 9mm x 5mm ceramic disk ave beads that have been glazed a beautiful shade of rich blue. They're joined by the soft gleam of 10mm pearl paters tucked between golden bead caps to create a unique and carefully hand crafted five-decade rosary. Every one of the 191 links on this rosary is carefully turned by hand. It's then finished off with a gold plated 28mm Madonna centerpiece and a large detailed 72mm cross with blue inlay at its end. 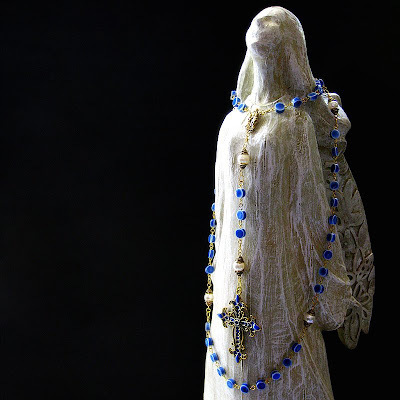 The rosary is quite long and measures 28.5-inches (72.4 cm) in length from "nape" to tip.